WYD hope: Alotau’s World Youth Day pilgrims and their supporters are hoping to raise $10,000 to make it to Krakow. TEN young people from a remote parish in Papua New Guinea are daring to dream they might still make it to Poland for World Youth Day. For the past 18 months, the youngsters from the Sacred Heart of Jesus Parish in Alotau have enthusiastically run raffles and fundraisers, overcome bureaucratic obstacles and prepared themselves spiritually for the biggest journey of their lives – but they are still $10,000 short. Brisbane school teacher and missionary Sarah Bunting, who is leading the youth pilgrimage to Poland, said it “seems an impossible situation” in a community operating at subsistence level, where few people have jobs and youth unemployment is close to 80 per cent. Alotau is the capital of PNG’s Milne Bay Province and is the gateway to some of the most remote islands remaining in the world today. 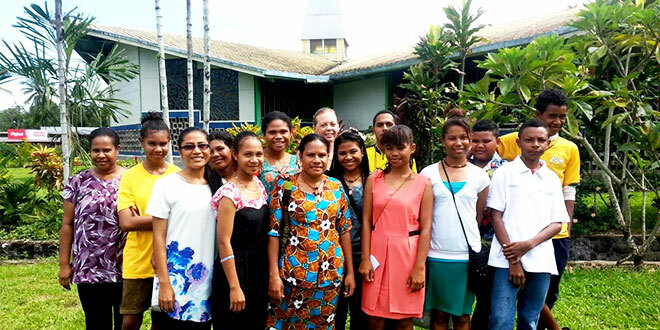 “Despite the remoteness and the poverty, ten young people are holding out hope they can represent so many thousands of others of our Diocese of Alotau, by visiting the homeland of St John Paul II; to respond to John Paul’s own invitation to ‘be a sign of hope for the Church, for your countries and for all humanity’,” Ms Bunting said. Ms Bunting said many of these young people had never even seen the world beyond their local village or province and preparing for WYD meant they had a mountain of paperwork to prepare. “Most didn’t have birth certificates or passports, and had never applied for a visa. Even attaining these basic documents has been an enormous venture,” she said. “But nothing can dampen their enthusiasm to try and raise the funds to get to Poland. “As Christians, they have believed in the word of mercy they have received from the Church and the promise that it offers to transform their lives. “They have held dances, cake and food stalls, ‘State Of Origin’ nights, raffles and the like. “They even spent several months rehearsing a catechetical play which was performed in the parish and showcased their commitment, creativity and love of music. “They are seeking the hope offered in the resurrection of Jesus Christ amid their sufferings. Fatima Jerome, a 24-year-old training to be a nurse, said she hoped the WYD pilgrimage to Poland would be a life-shaping event. “I need help in so many things. I am hoping to experience, along with all the other youth, the grace and love of God,” she said. “And for myself I am hoping it can help put me on the right path. “There are so many things that try to make me not follow God’s word but I can’t find happiness in always searching for good work and more money. Sacred Heart of Jesus parish priest Fr Richard Tomelty agreed the chance to join the WYD pilgrimage could have a huge impact on the lives of young people, the lives of their families and on the entire local community. “I went to one of the first World Youth Days myself. It was at Santiago de Compostela (Spain), in 1989 with Pope John Paul II, that’s where I first discovered my vocation to the priesthood,” he said. “Because I know first-hand the good that the WYD can do for the lives of people, I am very excited that ten of my young parishioners, who I have witnessed have worked very hard to earn and gather money for this WYD, may attend. Ms Bunting said she hoped the generosity of The Catholic Leader readers would raise the required amount of $10,000. She said Clairvaux MacKillop College, Upper Mount Gravatt, and Seton College, Mount Gravatt East, had already made donations to the pilgrimage. The Alotau pilgrims would link up with Australian pilgrims flying to Poland, and share their pilgrimage experience of WYD. “To be given the opportunity to participate in this pilgrimage during this Year of Mercy and personally receive Pope Francis’ message to all young people at WYD in Krakow is an invaluable gift that we desire for each of them; a gift that we hope the generosity of fellow Catholics will help grant them,” Ms Bunting said. For more information email Ms Bunting on sar_bunting@hotmail.com.